(Nanowerk News) By establishing a library of individual yeast genes, each cleverly tagged with its own molecular barcode, an international team of molecular geneticists has designed a valuable resource for pharmaceutical research with advantages over previous approaches. The research team, including Minoru Yoshida at the RIKEN Advanced Science Institute in Wako, and Charles Boone at the University of Toronto, Canada, developed the library in which each yeast gene is copied and attached to two unique single stranded DNA molecules that act as barcodes. This enables researchers to efficiently identify each gene. 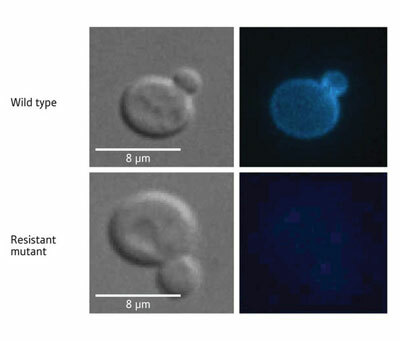 The yeast-based chemical-genomics approach, presented recently in Nature Biotechnology by Yoshida and colleagues, is useful because many medicinally important drugs target fundamental biological processes that are conserved between yeast cells and higher organisms ("A molecular barcoded yeast ORF library enables mode-of-action analysis of bioactive compounds"). Figure 1: Localization of a novel antifungal compound (left) visualized by fluorescent microscopy (right). The upper panels show normal (wild type) cells and the lower panels show a cell containing a mutant gene resistant to the compound. Using the team’s approach, all the gene-carrying units, or plasmids, in the yeast are carefully constructed individually, as opposed to conventional genomic libraries that are created from random fragments of DNA. Each plasmid carries a single yeast gene as well as two 20-nucleotide barcodes that identify it. The library comprises plasmids for almost 5,000 genes and covers approximately 90% of the yeast genome. Other approaches to examine the genetic influence of potential drugs have limitations such as needing high volumes of test compound, which can be of limited availability, or being labor intensive. Most significantly, the newly created gene catalogue will enable researchers to identify at the genetic level the precise modes of action of specific compounds that are being screened as potential pharmaceuticals. The library can be used to efficiently identify mutant genes that confer resistance to a test drug by comparing cells that show resistance and susceptibility to the compound. Determination of the mutant genes leads to the identification of the functional impact of a potential drug. In a demonstration of the usefulness of the library, Yoshida and colleagues identified the gene responsible for conferring resistance to a novel class of compounds with pharmaceutical potential (Fig. 1). Identifying this gene enabled the team to characterize the mechanism of action of these molecules and to determine that they are antifungal compounds, a property not detected by other techniques. An essential but challenging step in the development of small molecules into therapeutic drugs is identification of their cellular target. “Using this library, our group intends systematically to study chemical–genetic interactions in which an altered gene dosage or gene mutation leads to a change in cellular response to a bioactive compound,” says Yoshida.